The Heil NUG5075BFAZ is a fan-assisted gas furnace with combustion and circulating blower and a jet burner. The furnace has a manual gas pilot ignition and uses a Honeywell thermostat and fan control unit to set the fan and furnace temperature. As with any large home appliance, issues with the Heil furnace may occur occasionally that may be resolved through some basic troubleshooting methods. If troubleshooting efforts fail to resolve the situation with the furnace, contact Heil for repair assistance. Reset or replace the circuit breaker or fuse if there is no power to the furnace or the furnace has shut off unexpectedly. Make sure the gas valve is turned on if the pilot light goes out and does not re-ignite. The Heil furnace is designed to automatically re-light the pilot light if the flame goes out. Stop immediately if you smell gas, disconnect power to the furnace and leave the house. Call your gas company for help. 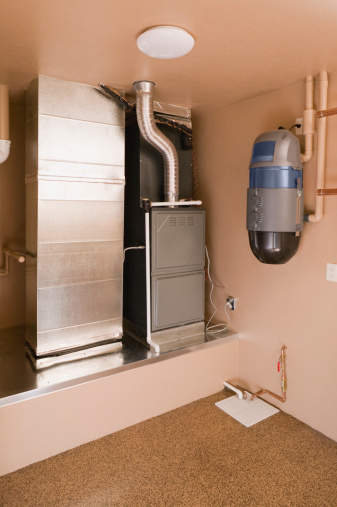 Disconnect power to the furnace and open the blower compartment door if the furnace is noisy or is not heating accurately. Pull back the filter clip and slide the filter out. Replace the filter if marked "Disposable" or wash with soapy water and rinse well if marked "Permanent." Let the filter dry completely before replacing it in the furnace. Spray the filter with filter coating spray, available at most hardware stores, if the filter is aluminum mesh. Attach the filter clips after making sure the air flow arrows are pointed in the same direction. Close the blower compartment door and restore power. Check the return air grilles throughout the home if the Heil furnace seems to be running constantly or is not heating the home as expected. Turn the thermostat to a temperature at least 10 degrees higher than the current air temperature and make sure the thermostat is set to "Heat." Adjust the pilot light if the flame is too low or too high, uneven or yellow. Remove the cap screw cover from the gas valve pilot adjustment screw. Rotate the adjustment screw in a counter-clockwise direction to increase the pilot flame. If the flame is too high, rotate the adjustment screw clockwise. Clean the condensate drain if the overflow drain is full of water. Disconnect the drain line cartridge and remove the end cap. Pour out the neutralizer and rinse the neutralizer and cartridge with water. Refill the neutralizer if the cartridge is less than three-quarters full. Remove the trap from the vent-connecting tee and rinse with water. Reinstall the float and reassemble the threaded connections, sealing with caulking if necessary.